Some accounts of the meeting gathered from participants during and after the European Meeting. We have slept on holy ground during our stay. Not because the place was like the stable in Bethlehem, or because we were in the crypt of a monastery, but because a man opened his home and his heart for eight young pilgrims whom he didn’t know at all in advance (Mt 25:35). I am filled with gratitude. Our family welcomed two young Polish participants, but it’s they who gave us so much. We said we were “one big family” and we really felt like that, sharing together the evening prayers, the vigil of New Year’s Eve, so much conversation and tears at the things which moved us. We celebrated the New Year with the big group of 200 who were welcomed in our parish, dancing and playing. It truly is when you give that you receive, and when you welcome a God-given opportunity something wonderful is given to you. For my teenage children it was a great experience of love. Karolina and Darek wrote as soon as they got back home. We had gone with them to see them off on the coach, and it was hard to see them go. Our trust in the reality of fraternal love has been strengthened, thanks to them. Now they have an Italian family, and we have a Polish one. On New Year’s Eve, the prayer vigil concluded with a candlelit procession as we sang “Laudate omnes gentes” as the fireworks were beginning to go off. Then we had the “Festival of Nations” in the parish hall: sketches, dances, games for everyone. The next day the meeting moved to its end. Some tears as everyone said goodbye. No more animator’s meeting at 10 o’clock in the evening – a rhythm we had got used to. Just empty, quiet rooms, to clean and to return to their normal purpose. And here I am writing as if everything is now “normal”, but within us remains an experience which tells us that a great joy is possible. On 31 December, in the evening, a prayer for peace was held simultaneously in the 200 host churches. Often, in addition to the prayer outline given in the Meeting Booklet, particular prayer intentions were mentioned. In the parish of Santa Maria in Campitelli, the people of Nigeria were especially prayed for, and in other places it was the people of Syria, or for Christians in the Middle East. From midnight on, the festival of nations provided the space for participants from each country to present a song, a dance, or a cultural tradition. 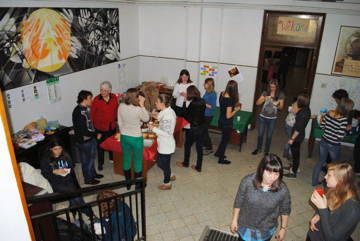 On New Year’s Day, many young people were invited to families for lunch. Some of the hosts made their offer of hospitality during the meeting itself. Many other participants shared the midday meal of the religious community where they were staying. Today we had lunch with an Italian family. Their hospitality impressed us! They live in a small flat and already accommodated three guests from the Ukraine for the meeting. You could think that this would be enough, but they were keen to to invite us in addition for New Year’s Day lunch, even though it was the also 50th birthday of the father. Although we were with only them for four hours, we felt really at home. They welcomed us openly and we somehow communicated with our hands and in a mixture of different languages! After we finished the five-course meal, we danced in their living room together. That was great! In Taizè you can meet people who, in religious and cultural reasons, are quite different from yourself, and you can sense that this variety in the world is a gift of God. So this is a special experience: on one hand meeting people who see things from such different points of view is so enriching. But there is also such a deep sense of community that one feels wonderment and almost fright. I think that this is part of God’s plan for us, so I am thankful to be able to be here and experience it. With the blessing of Metropolitan Vladimir of Kiev of the Ukrainian Orthodox Church, Bishop Hilary of Makarov attended the European Meeting in Rome. He was accompanied by Archimandrite Amvrosiy (Makar), the priest of St. Ambrose parish in Milan, and Archmandrit Filaret. During the visit bishop Hilary had a meeting with brother Alois and a discussion with young people who came to Rome for Pilgrimage of Trust from Ukraine and various other countries. 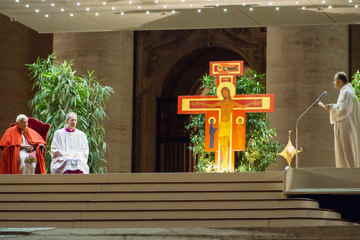 On 29 December, Bishop Hilary celebrated a public prayer in the chapel of St. Benedict of Nursia of the basilica of St. Paul outside the Walls. In the morning, participants gathered in their host parishes for morning prayer, then for small group meetings using the 3rd “Proposal” from Brother Alois’ message. In the afternoon, as on the day before, there were workshops on a multitude of themes. There was a visit to the Vatican Museums, and to the synagogue. Some went to visit and pray in the catacombs, others met with people involved in action for the unemployed and for refugees. The list of themes opened a very wide horizon. Today’s reading about keeping our eyes fixed on Jesus reminded me why I came to Rome: to discover more of my relationship with God. I went to a workshop involving a visit to the Catacombs and it was impressive to think how many people had been buried there. For me it showed great devotion to others, which I hope I can carry with me when I return home. On the last day of the year it has been good to reflect and look forward; remembering that we will tonight be sharing in the same faith as the third century Christians. Rome - it’s so special for me to be here at the meeting! It’s my first visit to Rome and the combination of this famous Christian city and Taizé is impressing me so much every day! During the prayers in the basilicas you can really feel that God is with all of us. Yesterday, I went to the Sistine Chapel – so much is talked about the paintings of Michelangelo and now I finally saw them, and we were even singing Taizé chants in there. For me it has been a great first experience of Taizé prayer, a great route into silence and time to be with God. Joining the Pope at the Vatican, praying in the Basilicas and seeing churches everywhere really brings an experience of being at the centre of the Christian world. It is also extremely encouraging to be with 40,000 other young people from across the world: the presence of the Holy Spirit is palpable and there is a wonderful sense of unity and belonging. In the basilica of Santa Maria sopra Minerva, where I am helping lead the “church team”, I am impressed by the dynamism and perseverance of the work teams. Each person is participating actively in helping the prayer go well in this basilica. You can see the joy on all their faces, and everything is accomplished in a spirit of simplicity. To be able to pray together, beyond all our differences, has become for me a sign of trust, peace and reconciliation. It has been the long moments of silence and the prayer around the cross after evening prayer which have struck me the most. This pilgrimage of trust on earth has been for me like a discovery of the origins of the Christian faith. 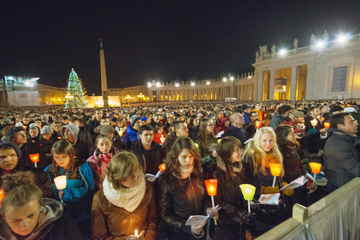 To see the whole of St. Peter’s square covered with young people, who came there to pray together, was a striking view. I felt that all what we have been talking so many times in Taizé actually came to be true: different Christian denominations were together praying near St. Peter’s tomb for solidarity and peace. The initial excitement with the arrival of the pope, when people were jumping out of their chairs trying to take pictures, was quickly gone, turning into something deeper as the prayer continued. Something that I will remember and keep in my heart. I took part in the three European Meetings held in Rome in the 1980s. When I heard that the pilgrimage of trust was once again coming to Rome, I was very happy. God knows how much we need more mutual trust! With my wife and my children, we decided to host two young people. Things being what they are, the two became four. The evening of the 28th, we had to find a solution, because we did not have two more beds. We found a mattress to put on the ground and improvised a second with pillows, blankets etc.. The whole family, mum, dad, two children and dog slept in one room, while our guests were in other rooms. The hardest part was definitely not sleeping on the floor (it rejuvenated us) but to calm the excitement of our two children, thrilled by the presence of young people uttering unintelligible words and smiling despite the fatigue of their long journey, and by the fact that the whole family was sleeping in one room. It will be hard to say goodbye when the meeting is over, but the experience will leave its traces in our hearts. It has made us a little more open to meeting other people in depth, it will have been an important step in the reconciliation of the Church, and allowed us to see the spontaneous joy of our children. 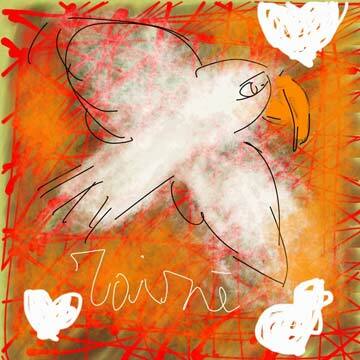 This picture representing a dove of peace was drawn by a child who lives in Rome during the meeting. We had heard some rumours over the last few weeks, and it’s great to have them confirmed. Next year, the Taizé European Meeting will be in Strasbourg. I really want to do all I can to help make that meeting the best it possibly can be. There’s a big challenge ahead of us: one year to get everything ready, and I really hope all the young people will be able to stay with host families in Alsace. When I heard the announcement that Strasbourg will be the venue for the next European Meeting, I was overjoyed. I received so much from the five European Meetings in which I have participated and am now looking forward to welcoming young people from all over Europe in my own home parish. After the meal at Circo Massimo, groups of people fanned out through the historic centre of the city following 4 different itineraries which passed by churches and major cultural sites. By mid-afternoon St. Peter’s Square was beginning to fill. At 6 pm, Pope Benedict greeted the crowd of young people, then he turned and knelt before the cross. And there was a sense that all were praying with him: a unique moment of fellowship in prayer. Below, some give their own impressions of the prayer on the second evening of the European Meeting. The prayer with the pope was been really moving for me. The huge square, all covered by candle lights ...incredible! And the silence.... Forty thousand people.... praying in silence. I thought it would be impossible. But it wasn’t. It made me think that it was a gift for us, that something like that only happens when God is near people and they sense his presence. Yesterday was like that. Jesus was among us, near each one of us, to pray, to love, to rejoice. It was a high point: different people, different languages, different denominations, all together for a special moment, and we were part of it. I felt a special bond to everybody else which gave me tears of joy. Now I can only be thankful, and say “Thank you” to God. Praying with tens of thousands of young people from all over Europe was a wonderful experience. Christ gathers us together in prayer and in joy, passing over our differences in nationality and denomination. It is a great sign of hope: all those smiling faces give me happiness and confidence. In my team of volunteers there is one girl who is always positive and smiling. I asked her where she gets it from. She said, “I love life and other people.” Love as a source of joy. The pope’s message spoke to me a lot too. He asked us to think about the question, “Who is Jesus for me?” He suggests that the answer we give can be real and will be able to give a meaning to our life. I think and sense that Jesus is my friend. But I need to find out more how to live out this friendship. “La nostra casa è la tua casa”, this is what my host family told us when we arrived their home. I am a foreigner in this continent but Rome made me feel at home. The European Meeting has managed to transcend cultural differences, language barriers and unfamiliar discomforts. Living with a Spanish speaker in an Italian family sounds so difficult and challenging, but not when your Italian host family speaks Italian, Spanish and English – even the kids! In our pilgrimage towards deeper relationship with God in the city where history and Christianity meet; I felt God welcoming each one of the 40,000 of us, with arms wide open saying, “Benvenuto my beloved! La mia casa è la tua casa”. Each day from 11:30 am onwards a hot lunch and a packed meal for the evening are distributed to the tens of thousands of participants. In about 30 minutes the Circo Massimo, which was used for the Roman games and where many Christians were martyred, became a park full of meetings and firendship. Having meals at the Circus Maximus is always fantastic for us. 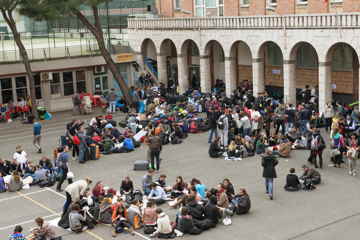 Today at lunch time we waited with tens thousands of other people in the line. The food delivery was late and we stood there for over an hour... then we finally got our lunch. 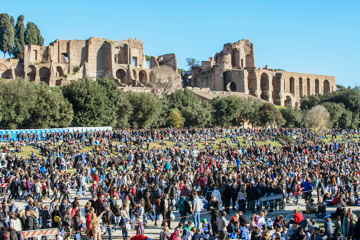 But we never worry - it was amazing to see the Circus Maximus so full with people waiting, singing and eating. The common prayers are held in seven big churches: the basilicas of St John Lateran, St Paul outside the Walls, St Mary Major, Santa Maria degli Angeli, Santa Maria sopra Minerva, Santa Maria in Aracoeli and the church Sant’Ignazio di Loyola. To get to the church where they will be praying, people follow an itinerary through the historic centre visiting other churches and places with stories to tell. Yesterday night we went to the basilica of San Giovanni in Laterano to pray together. The church, with its size and all its statues, decorations and beautiful paintings, was unlike any place I’ve ever seen before. It was surprising to see the large number of people who made their way here, and the prayer was truly amazing. It’s a memory that I will carry with me in the future, as it touched me deeply. As volunteers we arrived in Rome two days early. We were sent to the parish of Santa Maria Della Speranza. To begin with it seemed rather large and anonymous, but day by day it has become more and more like a family. We helped the young team in the parish, which is led by don Adamo, to welcome around 500 pilgrims from many different countries. Although none of the people of the parish had ever been to a Taizé meeting before, they managed the arrival of all their guests perfectly. It was great to see our two days of preparation working out in practice! Now those who arrived are settled and happy that the meeting is underway. Many pilgrims have come searching for something about the meaning of life. Together we gather as young people to share about life and about faith. Together in diversity, expressing solidarity — it’s very beautiful! And to see other young people sharing about their life is even better. Rome met us with thousands of birds and the smell of fallen leaves. It’s totally different here from where me and my friend come from. In Ukraine it was -10 degrees, frozen roads and everyone was wearing a lot of clothes. So we arrived in jackets and warm boots while the people in Rome wore shoes and light sweaters. Not only our souls, but also our hearts were filled with warmth, kindness and a feeling that everything has just begun and that the travelling for coming here was really worth it. Another feature of this year’s meeting is that many religious communities have opened their doors to welcome participants. I arrived in Rome on the 27th and a sister from the Piccole Sorelle di Gesù di Tre Fontane came to welcome me at the airport. In my home city in Finland, there are also some Piccole Sorelle di Gesù and they called their sisters in Rome so that we could get a place to stay for this meeting! I’m very happy to have just seen some Swedish friends whom I met at the meeting last year in Berlin! I still can’t believe that I’m in Rome. All the monuments create a magnificent environment for this meeting. Time goes fast with so many the activities. My job is to shoot video for the media and sometimes it’s not so easy to make a video when somebody stands up waving and shouts your name. Then you realise that it’s an old friend from a previous meeting or from Taizé. With so many encounters like this, how can you fail to be happy? The German-speaking Lutheran parish of Tokyo-Yokohama sends its greetings to everyone participating in the Rome European Meeting! Our prayer is with you and we wish God’s blessing for you. May this meeting go well, and contribute to making peace and reconciliation a reality in the world. Our world, even now at Christmas, so lacks peace: many people suffer from violence, hate and persecution. May the spirit and message of this meeting reach out into the world and into our daily life. 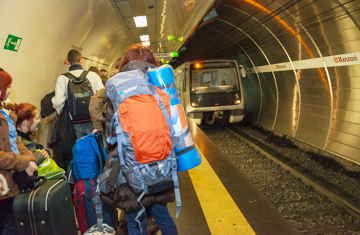 At the end of the journey to Rome, which for some had lasted several days, participants arrived in Rome. 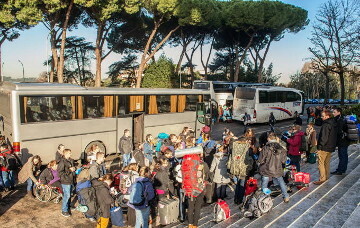 People got off the coaches in the outskirts of the city - the small streets of the centre would be unable to cope with such a large number of coaches - and from there took the metro to the University of Rome, La Sapienza, where they were welcomed in language groups. Then participants set out to their host parish or community all over the city and even beyond. The local teams then sent the young people to the different accommodation available: families, religious communities, and various places of collective accommodation. We have come to Rome as pilgrims. We are all on our way towards a more personal communion with God and a deeper communion with each other. What are we hoping to experience these days? In Rome we shall discover traces of the faith from the time of the apostles, down the ages to the present day. As people from different countries and of different Christian denominations, we shall discover a greater depth of solidarity; and that at a moment in history when material constraints are acting in the other direction: pushing people towards fear and closing up with their own. By our meeting we shall open wide the gateways of trust and solidarity. Throughout the day of 26/12, 1800 volunteers arrived. They had come two days early to help in various work teams and the choir. They were welcomed in one place: the Santa Maria Institute in the city-centre. 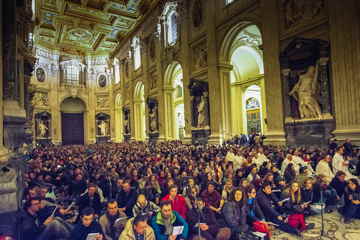 The first prayers were held at 2 and 7:30 pm in the basilica of San Giovanni in Laterano. It was great to see so many participants - the church already looked full, though of course the big arrival of participants is yet to come. The Rome meeting will be different — that’s what we heard as soon as we arrived at Santa Maria this morning. No prayers in exhibition halls, with sticky tape marking out the aisles: this year we shall be praying in all the biggest churches of Rome. So our adventure began: luggage lost and rediscovered, an overfilled public transport sytem, and surprisingly good food. How will it all unfold? We are looking forward to finding out! If you are taking part in the meeting in Rome and wish to contribute something written or an illustration for this page, contact echoes taize.fr.